It was in 1987 that the "Final Fantasy" video game franchise was born. In Japan, Nintendo's gaming system, known as the Famicon, was the top dog in the industry. Among the dime-a-dozen software houses that had sprouted up around the 8-bit system was hit-starved software publisher Squaresoft, which was on the brink of collapse. Gambling the company's future, Hironobu Sakaguchi decided to compete in the still-nascent role playing game (RPG) genre, which was dominated by first-mover Enix and their best-selling "Dragon Quest" cartridge. Given that their sword-and-sorcery-themed RPG was the company's last chance at survival, the game was dubbed "Final Fantasy". Fortunately, Sakaguchi's daring was rewarded with a top seller, and the "Final Fantasy" series of games would grow to become one of the most recognized brands in the RPG console gaming. Though the initial entries in the series were limited by the technical constraints of the 8-bit Nintendo and 16-bit Super Nintendo systems, what set the "Final Fantasy" games apart from the competition was the focus on great storytelling. Instead of limiting themselves to the typical 'rescue the princess' plot of other RPGs, the developers at Squaresoft crafted epic-sized narratives with large casts of characters that matured, switched sides, or even died in the course of a 40+ hour game. When the series finally reached the CD-ROM-friendly Playstation platform in 1997, the games had evolved to a level of sophistication that began to blur the distinction between games and movies. For the production of "Final Fantasy VII", Squaresoft had spent an unprecedented $30 million US to create hours of computer animation and symphonic orchestrations to create a cinematic experience for gamers. And with each subsequent release of "Final Fantasy" games, the bar continues to be raised, such as the imminent release of "Final Fantasy X" on the Playstation 2 platform, which will include the use of voice for the first time, courtesy of Hollywood's brightest stars. With the growing sophistication of the "Final Fantasy" series that has evolved the gaming experience into a more cinematic one, the 1997 announcement that Squaresoft was entering the movie business wasn't a complete surprise. After all, the technical and storytelling competencies used to create the "Final Fantasy" games could easily be re-purposed for making a feature-length film. Thus, after having spent over $40 million to create a state-of-the-art animation facility in Hawaii, employing over 200 animators, and toiling away for four long years, "Final Fantasy: The Spirits Within" came to be. 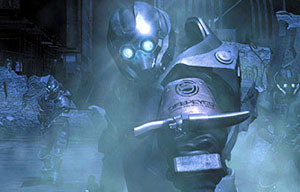 Though fans may be disappointed in how it eschews many of the time-honored fantasy elements of the game franchise and how its sci-fi script filches elements of "Aliens", there is little doubt that "Final Fantasy: The Spirits Within" is a technically-accomplished moviegoing milestone, offering the most photo-realistic computer animation to date. The year is 2065 and life on Earth has been decimated by 'phantoms', ghost-like alien invaders who have the ability to extract the life force from any living being. As a result, the phantoms have bled the planet dry of all life, and all that remains of human civilization are a few domed cities. Among the survivors are scientist Dr. Aki Ross (voiced by Ming-Na, who also voiced "Mulan") and her mentor Dr. Sid (Donald Sutherland of "The Art of War"), who believe they can rid the alien infestation once and for all by collecting eight 'spirits' and subsequently unleashing an energy wave that will nullify the alien life force pattern. 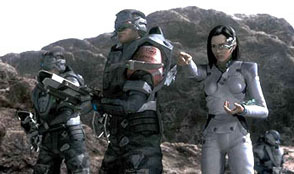 They are aided by a small 'Deep Eyes' commando team that includes the stoic Captain Gray Edwards (Alec Baldwin of "Pearl Harbor"), the jokey Neal Fleming (Steve Buscemi of "Armageddon"), the buff Jane Proudfoot (Peri Gilpin of TV's "Frasier"), and the level-headed Ryan Whittaker (Ving Rhames of "Mission: Impossible 2"). 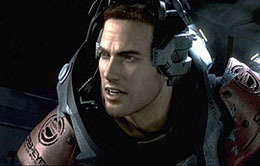 However, they are at odds with the ruthless head of the military, General Hein (James Woods, seen recently in "Scary Movie 2"), who prefers to use the power of the new Zeus orbital weapons platform to destroy the aliens. Unfortunately, wielding such a weapon may also inadvertently destroy the Earth in the process, so it is up to Dr. Aki and her team to collect the spirits before Hein gets the upper hand. Script-wise, the plot of "Final Fantasy: The Spirits Within" hardly offers anything new. Many sci-fi fans will experience a sense of déja vu à la "Aliens" as Aki and her Deep Eyes cohorts contend with alien phantoms that seem to pop out of every nook and cranny. 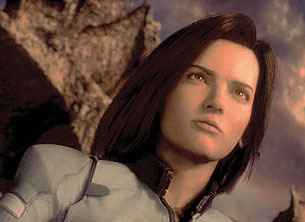 Fans of the "Final Fantasy" game franchise will also recognize a number of familiar narrative elements, particularly the quest-type story, Aki's realization that the key to saving the Earth lies within her own self, and little nods to the mythology of the games (such as the inclusion of a character named Sid). In addition, fans of Japanese anime "Princess Mononoke" will also note the thread of 'man vs. the environment' conflict figures heavily into the story, as Aki and Sid must restore 'balance' in nature in order to save the Earth from invaders who are not as they appear. 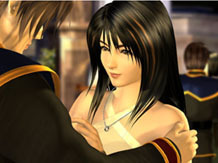 However, the reason why most moviegoers will be clamoring to see "Final Fantasy: The Spirits Within" is because of the state-of-the-art computer animation and its use of 'virtual actors'. While it is quite obvious that the film is not live action, Sakaguchi and his team have created some of the most photo-realistic animation to date, particularly in scenes staged in low-lighting conditions, where the line between reality and animation becomes credibly blurred. The motion of the 'virtual actors' also appear mostly natural, though there a few glitches, such as a mismatches between dialogue and mouth movements (particularly with Buscemi's Fleming character) and some emotional reactions that aren't completely convincing. However, compared to the then-state-of-the-art animation seen in the original "Toy Story" a few years ago, "Final Fantasy: The Spirits Within" is a quantum leap in computer-generated imagery, and an exciting tiding of what may become commonplace in a few short years. The line between the virtual and the real has also become blurred with the marketing of the film's virtual actors'. Recently, Sakaguchi announced that Square Pictures is in negotiations with Columbia Pictures to have Aki and Gray appear in future computer-generated features, as though they were actual 'actors' playing different roles (such as a 'teenaged' Aki in a 'tween'-oriented production). Aki herself has become a bit of a personality, having appeared in Maxim magazine's recent '100 Most Beautiful Women' photo spread (she came in 87th)-- watch out Lara Croft (star of the "Tomb Raider" video games). In the final analysis, "Final Fantasy: The Spirits Within" is perhaps the most satisfying video game-to-movie adaptation to date, as it successfully brings the long-running game series' visual and storytelling flair to the big screen. True, the script may be derivative and the dialogue may lapse into melodrama from time to time, but with uncanny state-of-the-art computer animation (that even puts the recent "Shrek" to shame), top-drawer voice talent, and a decent story, Hironobu Sakaguchi and his team at Square Pictures have crafted a truly landmark film.